Outliner's PRO version learned sharing. First you have to define a favorite outline via "Settings, Set Inbox". If you afterwards share any text (e.g. 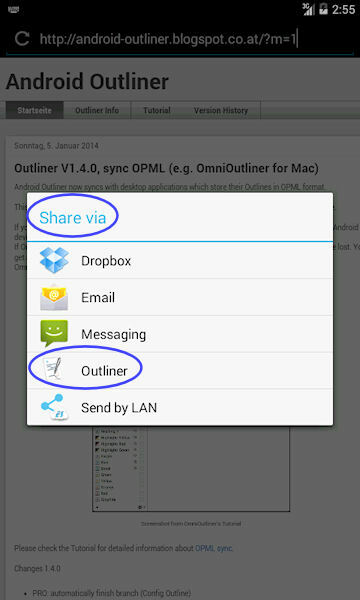 a web url from within your browser) and you choose Outliner as sharing target, Outliner opens your inbox outline and adds the text as a new activity at the end. You can edit the information before saving it. The back button brings you straight back to your web site within the browser. 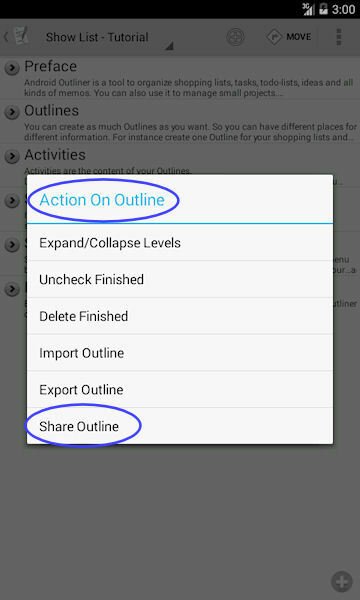 In the list of activities "Action, Share Outline" creates a simple HTML file which you can send to your mail client, to Dropbox or your file manager for saving. This is very similar to exporting to HTML and sending via a file manager, but much quicker. Use a double tap to toggle move mode. Do not use the tutorial for production data. Updating Outliner overwrites the tutorial.